1. Good for middle age, senior age and old people. Long term walking on massage mat can improve the micro-circulation of the second heart of human body (foot) so that to get better irritative effect to the end of nerves and enhance to get better propitiatory affect to the spirit. This has enhanced assistant treatment effect and health care effect to the popular diseases. 2. Good to people sitting to work and study for a long time. By using healthy foot-massage mat, the above diseases can be removed or eased greatly. 3. 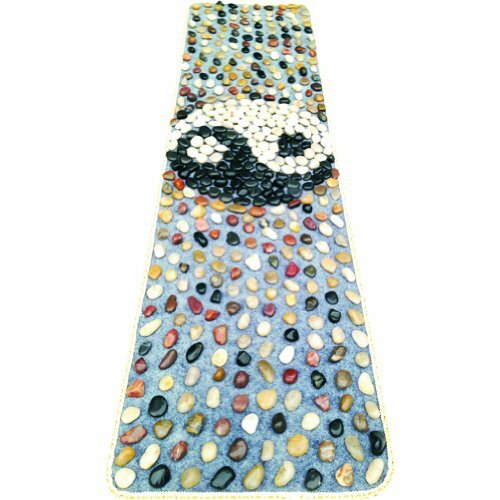 The Cobblestone Mat helps users improve circulation while reducing blood-pressure. The positive effects of foot reflexology paths have become more widely recognized. * We use natural cobblestones to produce the massage mat. Each piece of cobblestone is exclusively unique in the world. The massage mat you get may have small differences with the image. An easy way to keep fit and health. All made of NATURAL pebble stones. Suitable for officers and senior ages.